What better book to review on Super Bowl week than a book about Brady? 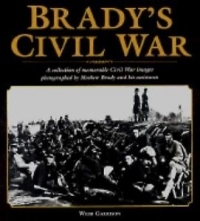 Except I flipped through most of this last week, only finishing it this week, and the Brady in question is Matthew Brady, the mid-ninteenth century photographer, and not the football player. Other than that, it’s almost the same thing. The book sat on my side table for flipping through during football games, but the paragraph-length text was a little too detailed for distracted browsing, and the coffee table book size made it unwieldy for the sofa. But now that I’m clearing the books from that table, I spent some dedicated time with it. 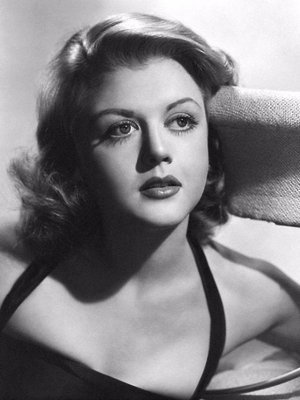 Historians spend a lot of time poring over these photos in detail, but I looked at them a little less studiously. Mostly marveling at the photographs that are 150+ years old. I did spend a lot of time with the captions, though, more than the glances at the images themselves. As I always do when I review picture books from the Civil War, I realize how little I really know about the details of it. I could do better, as I inherited a decent collection from my beautiful wife’s uncle, and I did just buy a reading copy of Ulysses Grant’s memoirs. Perhaps I need to want to brush up enough to stack the books on a table and then, in a year or so, make it a project to read them all to get them off the table. At any rate, back to this book: A good collection, and amazing, of course, that these are pictures. Of the Civil War. So we’ve got to design a bag for cherries. 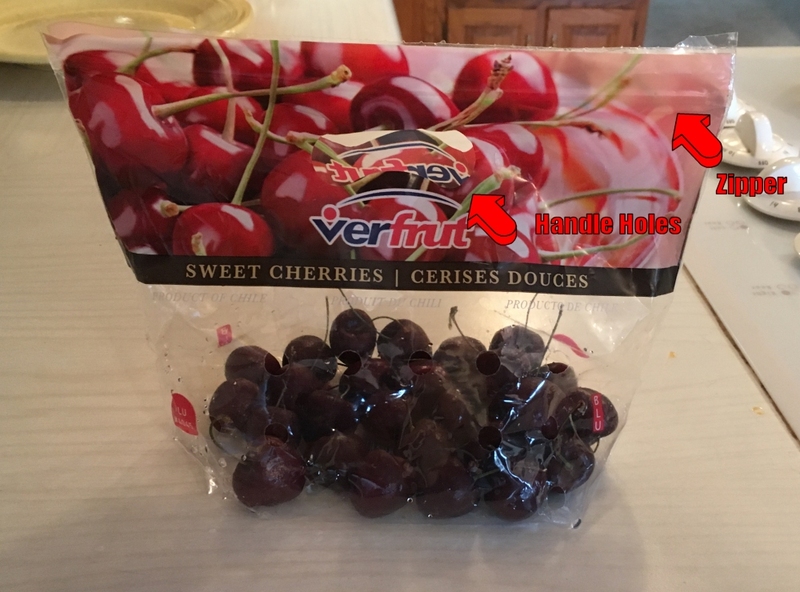 Of course, we’ll put a zipper at the top to keep the cherries from spilling out; all grape and prepackaged produce bags have them, so it’s a matter of course. But you know what we need to really differentiate our bags? How about cutting holes in the bag to make it easier for the customer to pick up the bags on impulse. This book is a chapbook of poetry written by an elderly woman in the twentieth century. 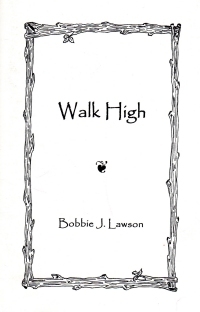 The book itself is not dated, but one of the poems says now in ’91, and there’s a prose story that praises one of Lawson’s relatives that is dated 1998. I cannot find any information about the author or this book on the Internet, so you’ll have to trust me that it exists at all. 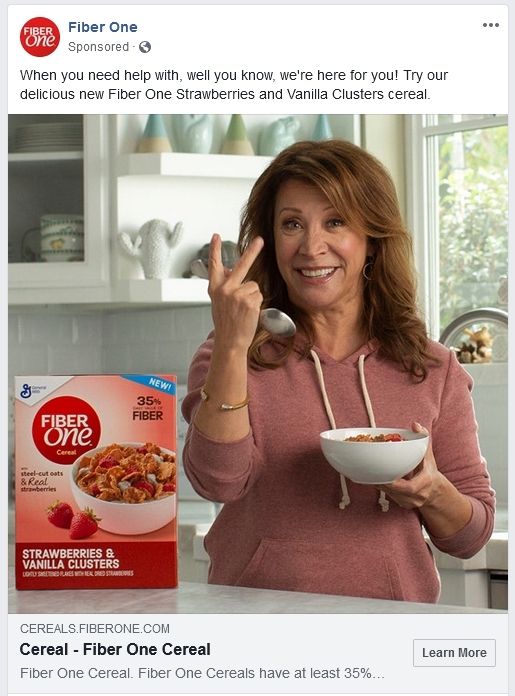 It’s a little like Leah Lathrom’s The Best of Wheat and a Little Chaff. The poems are simple, faith-based lyrics with good rhythm and end rhymes. Many, if not most, of the poems end with a Bible verse that inspired the meditation. Pretty simple things, not great literature, but a pleasure to read. A couple focus on the gospel teaching of not worrying about tomorrow and being thankful for what you have today, which you know, gentle reader, is a theme I constantly try to embrace and embody, so I really enjoyed those poems the most. Also, note I enjoyed it more than the aforementioned Lathrom book. I love buying the packets of chapbooks at the Friends of the Springfield-Greene County Library for books like this. Brian J., Did Nogglestead Get Any Junk Mail On Saturday? I would say that it’s all my shell companies that I use to hide my ill-gotten gains, but, really, we have mail for two former owners of my beautiful wife’s company, two current owners of the same, me, and the “media company” owned by the son of this home’s former owners (nine and a half years gone) that left a couple of swords made from table legs and scrap lumber in our shed (that my boys still haven’t found and bludgeoned each other with and that I cannot throw away in case of apocalypse where I’d wish I hadn’t thrown them away should somehow I lose my two real swords and halberd and, oh, yeah, guns). 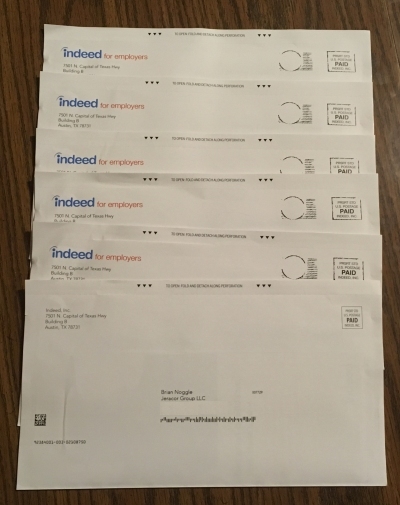 But six pieces of mail from what looks to be the same campaign? Indeed.com is casting a very wide net. It was 1982. I was freshly ten years old; my parents were separated for probably a year. 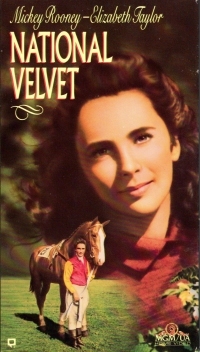 My mother listened to country and western on the radio when we lived in Milwaukee before shifting to oldies when we lived in St. Louis, which explains my listening habits as I grew up (I didn’t learn I could change the station on the radio and did not have a radio of my own until I was about thirteen, which explains why I was so pressed to think of a pop song as a favorite song on a questionnaire when I was chosen as Student of the Week in eighth grade and had to go with “Ghostbusters” as both my favorite song and movie). We spent a lot of time with the Odya boys, and I remember singing along with them when “The Bird” came on the radio. I’m not sure I had heard the song between then and looking it up on YouTube to post as a comment on Facebook. But now I have, and I feel all thirty-six years that have passed. It’s kind of funny: I read tourist guidebooks for places I have not visited (such as Chichen Itza), and I don’t have trouble counting them in my annual reading list. But when I read a book about a place I have been, especially when it’s the same sort of touristy guidebook but for a place that I’ve been or a tour I’ve taken, suddenly I feel guilty for counting it in my annual total. You would think, gentle reader, with all the trickery I use to pad my annual books read total, I would become inured to the pangs. Oh, but no. Regardless, I counted this, and you get to read a bit about what I think on it. I bought this book on our 2017 trip to Wisconsin. 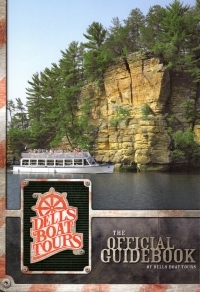 The book covers a boat tour of the upper Wisconsin Dells; that is, the side of the river north of the dam downtown (in 2015, I suffered the same pangs when I reviewed a guidebook for a Duck Boat tour of the lower Dells in Old Trails and Duck Tales). As such, it recounts some of the history of the area along with some of the questionable stories told in the boat crew’s patter. It includes bits about moving lumber down the river (the last such trip was in 1890; in context, this was four years after the last Impressionist art exhibition in Paris which featured Mary Cassatt–these two events would seem to be from far different times, but they were contemporaneous), and Witch’s Glen, a narrow gorge where tourists land and walk through a very cool and very narrow canyon to a gift shop run by the boat tour company. With many of these stories, one has to wonder how much of the history and stories are retconned to fit the places where the boat goes and how much is true. Probably most of it, but you have to take it with a grain of salt. Although I learned quite a bit about Ho Chunk history on the tour which this book refreshed. Okay, the “quite a bit” is just my saying, “That should be Ho Chunk now” when passing a Winnebago RV on the road. But still. I’m pleased to have read this book(let) as it refreshed some memories from that trip and the stories I heard on the tour. Which makes it more resonant than some of the guidebooks/tour books I read. 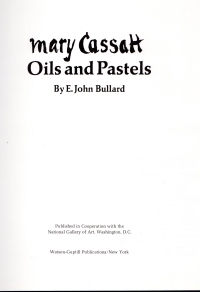 This is the second of the two books I bought about Cassatt last fall (the other was entitled simply Mary Cassatt. Of course, the book has the standard art book template: A bit of bio in the beginning and full color plates of samples of Cassatt’s work along with a couple paragraphs of text about each. It’s pleasant to revisit the works that I have most likely seen recently. The book plays up the relationship between Degas and Cassatt, wondering whether they had some romance that was stifled because her father did not like Degas. I mentioned in my book report on [John Singer] Sargent that he and Cassatt were contemporaries; this book says he got her a portrait commission on one of her trips to the United States (remember, gentle reader, this “middle class” young lady traveled and settled in Europe). Cassatt completely rejected Matisse’s work. In a letter to Louisine Havemeyer in March 1913, she exclaimed, “If you could see his early work! Such a commonplace vision, such weak execution, he was intelligent enough to see he could never achieve fame, so shut himself up for years and evolved this and has achieved notoriety…. It is not alone in polities that anarchy reigns, it saddens me, of course it is in a certain measure our set [the Independents] which has made this [freedom] possible. I think the insertion of [freedom] instead of [excrement] is pro-Matisse commentary by this book’s author and not necessarily the intent of Cassatt. But I agree with her assessment (see also my report on the monograph Matisse. With this, though, Cassatt moves easily into a second-place tie with Manet in my list of favorite Impressionists. Worth a browse, certainly, and worth the couple of bucks I paid for it at the autumn Friends of the Springfield-Greene County Library Book Sale. 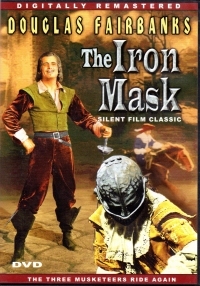 Side note: Interestingly, Cassatt, the nineteenth century artist died in 1926, just three years before The Iron Mask was released. They seem of two completely different eras, but history is ultimately seamless. Well, it sort of emerged. I found another Christmas decoration in the first place you would think I would look: The mantel in the living room. It’s a litte sculpture that was hidden behind a framed photo. I found it when I was dusting. I think it’s supposed to be a church. One of my sons made it two years ago, when he was ten. And he’s no worse with the polymer clay than I am. 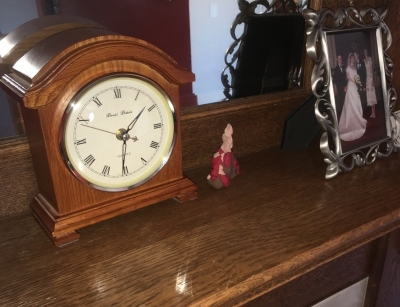 You’re right, it’s the first time I’ve dusted the mantel this month, and I would have found it earlier if only I were a better housekeeper. But I’m too busy blogging for my seven daily Google-search readers a day to bother with maintaining or improving the place I live. 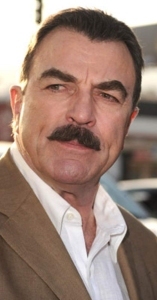 Besides, after nine years, we’ve about sucked the blood out of Nogglestead, and it might be getting time to find a new host. And here I thought I caught the annual Christmas Straggler two weeks ago. For Christmas, my oldest son received a gift card to a local sporting goods store along with a skateboard helmet, and at the end of last week, he actualized that gift card into a skateboard. Which has led me to needing to announce the rules for the skateboard. Rules which I would have thought are akin to natural laws, that my pre-teen boys could reason or infer out of other rules that they have been told as well as the laws of physics they know. No riding the skateboard in the house. No skateboarding in the dark. No skateboarding in the rain. No skateboarding before 6:30 am. No skateboarding in the dark and rain before 6:30 am. No firing Nerf guns from on the skateboard. One person on the skateboard at a time. No riding the skateboard into the house or any part of it. No hitting another person with the skateboard. That’s why the call me Daddy Deutoronomy. Or they would if they’d thought of it. So the guidebook to this course presents me with a little dilemma: Should I count it as a book against my annual reading or not? I mean, I counted the guidebook for the course From Yao to Mao: 5000 Years of Chinese History as a book, but not the one for Elements of Jazz: From Cakewalks to Fusion. Of course, the former was over 100 pages, and the latter was like 25. 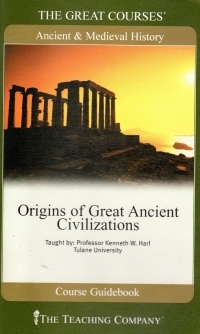 The guidebook to Origins of Great Ancient Civilizations is 72 with the glossary, timeline, and bibliography. All right, you have convinced me to count it as a book read in 2019 even though I listened to the course probably over a year ago and only completed the guidebook now because I found it at one of my book accumulation points. At any rate, this is a fascinating course, twelve lectures in all, that covers Egyptian and Mesopotamian civilizations (with a bit of a nod to early civilization in the Indus River valley, but as this last was not that well explored at the time of the course, it only gets passing recognition). The course covers the Bronze Age to the Early Iron Age, so you’ve got lectures on Sumer, Babylon, Egypt, Assyria, Israel, and the Persians as well as mention of the Hittites and Chaldeans and other tribes in those time periods who made a name for themselves. This sort of holds true for the Egyptians, whose civilization is controlled at various times by tribes from the Delta, tribes from up the river, and Greek peoples. The tribes that roam back and forth over Mesopotamia, though, aren’t characterized as a single civilization. I wonder why this is. The limited geography of Egypt versus the distributed loci of the other civilizations’ power? Aliens? From the lectures and the guidebook, I come away with a vague understanding of the succession of the small empires and their chronology, and I will have something to say about the origin of the peoples in real life called Akkadians or Cimmerians when my boys are old enough to watch The Scorpion King or Conan the Barbarian. Reviewing the guidebook makes me want to go through the lectures again, which is probably as high of praise as I can put into a brief report on the course. Also, in retrospect, I want to count the much shorter guidebook for Elements of Jazz to my annual list. For Christmas, I received a large gift card to Barnes and Noble, which meant that I needed, needed to make a trip to the store to buy some books, as I’ve not bought any in five whole days. 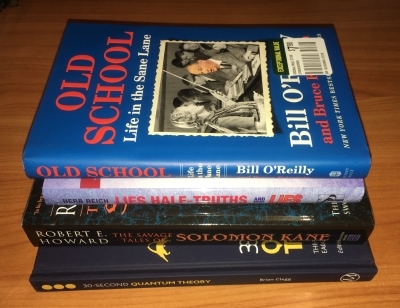 Old School: Life in the Sane Lane by Bill O’Reilly with Bruce Feirstein. I just bought a Bill O’Reilly book almost five days ago; note his co-author is the author of Real Men Don’t Eat Quiche and a long-time friend of O’Reilly. Lies, Half-Truths, and More Lies by Herb Reich, a de-bunking of received and school-taught wisdom. The Savage Tales of Solomon Kane by Robert E. Howard. I used a gift card some five years ago on the three volumes comprising the complete Conan collection (The Coming of Conan the Cimmerian, The Bloody Crown of Conan, The Conquering Sword of Conan). I’m not familiar with Solomon Kane, so I’ll get a whole new experience here. 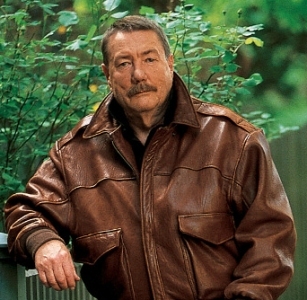 The funny thing is when I bought the Conan books, the Howard section of science fiction and fantasy was chock full of books. This time, there were only four Howard titles available. 30-Second Quantum Theory by Brian Clegg which is one pager overviews of concepts in quantum physics. Given that I’m ever hopeful that one of these books will help me get over the hump in understanding advanced physics, this book might help. When I find it again. So I’ve bought a total of 12 books in the last week. I’ve read eleven, and that’s only through my usual accounting trickery. It’s clear why I continue to fall behind: I have more books already than I can ever read, but not more than I can ever want. This is one of the two “art” books I bought for a buck last month in Osage Beach (I already read the other, Painted Treasures). This book is not so much of a how-to project book, although there are a couple step-by-step picture sets, a couple materials lists, and text about considerations and planning, but mostly it’s photos to use as inspiration for your own mosaic projects. The book includes some client commissions that the author did, including a swimming pool that’s quite out of the reach of hobbyists, and many of the photos are variations on a theme (a sculpture flower is represented in various colors and sizes). But it did make me want to try my hand again at mosaics. I say “again” as though I’ve ever done a serious mosaic project, but I haven’t; I did a couple in art class in school, and I did a construction paper and glue mosaic of a city skyline when doing art with my children once some years ago, but nothing serious. Oh, and I learned from this book that they make epoxy glue guns, which I had not realized. 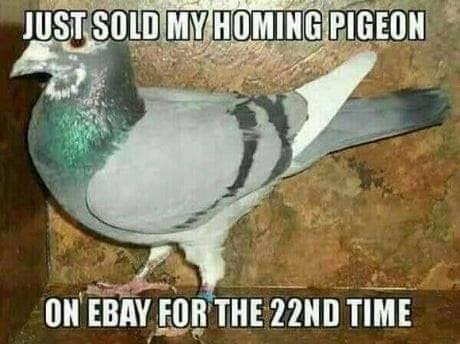 I’ll have to get one sometime to see if it works well, or if it’s just like the syringe-like blenders that come with the blister packed epoxy at the hardware store. 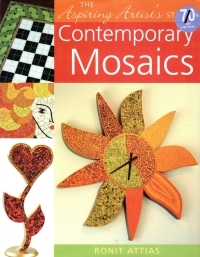 At any rate, worth a browse if you’re into mosaics, especially if you can find it for a buck. Which you probably cannot, as I got the last one. I go through phases listening to these CD courses, and I think I’ve figured out the secret. I tend to accumulate courses in subject areas with which I’m already familiar, like philosophy or literature, and they underwhelm or bore me. That, and if they’re a summary course from the 21st century, I’ll find enough to disagree with politically to not really want to finish them. But something I’m not really familiar with, such as deep dive history courses (not summary courses) or music courses, these I listen to with some zeal, and I learn a lot more from them probably because they’re completely new knowledge to me and not merely rehashing what I already know. 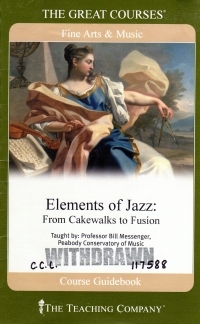 I really enjoyed this course for those reasons, if they are the real reasons why I get away from listening to these in the car, and because I rather like jazz music, but I’ve not really been educated in it. Until now, a bit. The course is eight lectures. The first seven talk about a building block in the evolution of jazz, and the last has the lecturer, a known jazz pianist, improvising with some other artists to illustrate how it works. The building blocks include cakewalks, ragtime, blues, swing/big band jazz, boogie and bop/bebop, and modern jazz including free jazz, cool jazz, and fusion. I’ve learned a heck of a lot about music, including what syncopation means (although I’ve read the word, I’ve never tied it to the actual sound), the origins of the words in jazz (jazz, ragtime, bebop, and so on). And I’ve identified the styles of jazz I prefer (swing, cool jazz, and fusion)–although I would have probably guessed these. Also, I like free jazz like I like Matisse. Which is not at all. So I’m glad to have spent, what, six hours on this course. I wish it were longer. I wish I could play a boogie woogie bass line on the piano. I have tried because of this course. So take that as an endorsement. Unfortunately, I have a five foot shelf of other courses which on DVD and/or fit the bill of courses that I have mentioned aren’t the ones I get the most from. So expect other entries in this series irregularly.